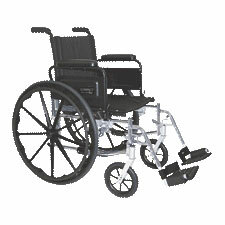 The Compact 777 is the best choice for high strength lightweight wheelchair. It is engineered to provide maximum durability and comfort for active individuals who seek a modern look and great performance in an up scale wheelchair. With its adjustable front casters and rear wheel axle positions; this wheelchair offers wide selections of seat heights and angles. High strength lightweight chrome plated frame with wrap around, swing back arms. Dual rear axle position, multi-angle caster stem, & height adjustable front caster fork. Padded breathable nylon upholstery, padded arm pads & calf pads. 8" x 1" caster wheels with lightweight polyurethane tire. 24" x 1" rear molded wheels with lightweight polyurethane tire. High impact composite side panel, foot plates.